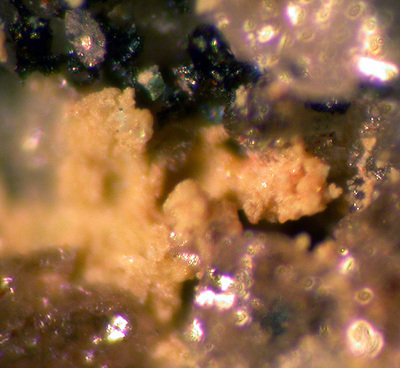 Beaverite-(Cu): Mineral information, data and localities. In the ideal end-member Fe3+:Cu is 2:1. Named beaverite for its first recorded occurrence, Beaver County, Utah, USA. Redefined by Bayliss et al. (2010) as beaverite-(Cu), for its specific composition. Compare beaverite-(Zn) and also osarizawaite. Can be distinguished from plumbojarosite only by accurate determination of the Fe:Cu ratio. Other Fe members of the alunite family are also visually very similar. Earthy and friable masses comprised of microscopic hexagonal plates. Cuprian Adamite 6 photos of Beaverite-(Cu) associated with Cuprian Adamite on mindat.org. Goethite 5 photos of Beaverite-(Cu) associated with Goethite on mindat.org. Cuprite 4 photos of Beaverite-(Cu) associated with Cuprite on mindat.org. Iodargyrite 3 photos of Beaverite-(Cu) associated with Iodargyrite on mindat.org. Mimetite 3 photos of Beaverite-(Cu) associated with Mimetite on mindat.org. Osarizawaite 2 photos of Beaverite-(Cu) associated with Osarizawaite on mindat.org. Cuprian Beudantite 2 photos of Beaverite-(Cu) associated with Cuprian Beudantite on mindat.org. Plumbojarosite 2 photos of Beaverite-(Cu) associated with Plumbojarosite on mindat.org. Ferrilotharmeyerite 2 photos of Beaverite-(Cu) associated with Ferrilotharmeyerite on mindat.org. Smithsonite 2 photos of Beaverite-(Cu) associated with Smithsonite on mindat.org. Butler, B.S. and Schaller, W.T. (1911) Beaverite, a new mineral. Journal of the Washington Academy of Sciences: 1: 26-27. Butler, B.S. and Schaller, W.T. (1911) American Journal of Science: 32: 418. Larsen, E.S. (1921) The Microscopic Determination of the Nonopaque Minerals, First edition, USGS Bulletin 679: 45, 201. Kingsbury, A.W.G. and Hartley, J. (1957) Beaverite from the Lake District. Mineralogical Magazine, vol. 31, n° 239, 700-702. Kingsbury, A.W.G. and Hartley, J. (1960) Carminite and beudantite from the northern part of the Lake District and from Cornwall. Mineralogical Magazine, vol. 32, n° 249, 423-432. (includes reference to (includes a reference to type material beaverite, see Butler and Schaller (1911)). Breidenstein, B., Schlüter, J., and Gebhard, G. (1992) On beaverite: new occurrence, chemical data and crystal structure. Neues Jahrbuch für Mineralogie, Monatshefte (1992): 213-220. Anthony, J.W., Bideaux, R.A., Bladh, K.W., and Nichols, M.C. (2003) Handbook of Mineralogy, Volume V. Borates, Carbonates, Sulfates. Mineral Data Publishing, Tucson, AZ, 813pp. : 56. Sato, E., Nakai, I., Miyawaki, R. & Matsubara, S. (2009) Crystal structures of alunite family minerals: beaverite, corkite, alunite, natroalunite, jarosite, svanbergite, and woodhouseite. Neues Jahrbuch für Mineralogie Abhandlungen 185, 313-322. Bayliss, P., Kolitsch, U., Nickel, E.H., and Pring, A. (2010) Alunite supergroup: recommended nomenclature. Mineral. Mag. 74, 919-927. Vennum, W.R.; Nishi, J.M. (1981) New Antarctic mineral occurrences. Antarctic Journal of the U.S., 16(5), 14-15. Downes, P.J., Deacon, G.L., Grguric, B.A., Bevan, A.W.R., Blockley, J., Verrall, M. (2017): Minerals of the Northampton Lead-Copper Field Western Australia, Australian Journal of Mineralogy, 18 (1), 35-49. 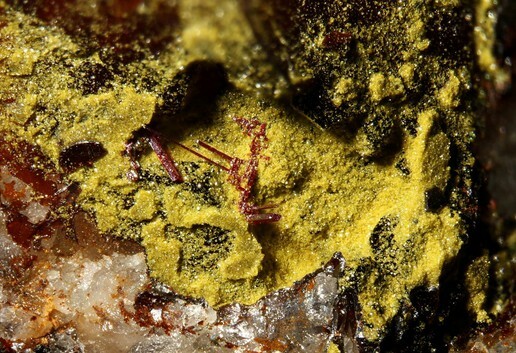 Jorgensen, G.C., Downes, P.J., Deacon, G.L., Verrall, M. (2017): Wulfenite from the Penny West gold mine, near Youanmi: a new occurrence for Western Australia. Australian Journal of Mineralogy, 18 (1), 23-33. Blaß, G., Graf, H.-W. & Pichler, A. (1997): Sekundäre Neubildungen in Schlacken von St. Martin am Silberberg in Kärnten (1). Mineralien-Welt, 8(5), 42-45. Kolitsch, U. (2014): 1993) Beaverit-(Cu) und ein Mineral der Cyanotrichitgruppe aus einer Kupferschlacke bei Kalwang, Liesingtal, Steiermark. P. 138 in Niedermayr, G. et al. (2014): Neue Mineralfunde aus Österreich LXIII. Carinthia II, 204./124., 65-146. Kolitsch, U., Postl, W., Brandstätter, F., Bernhard, F., Leikauf, B. & Auer, Ch. (2011): 1713) Beaverit-(Cu), Brochantit, Carbonat-Cyanotrichit, Chalkoalumit und Schwefel aus dem Kupfer-Vorkommen der Wolfsgruben bei Seiz, Liesing-Paltental, Steiermark. Pp. 179-181 in Niedermayr, G. et al. (2011): Neue Mineralfunde aus Österreich LX. Carinthia II, 201./121., 135-186; Leikauf, B., Bojar, H.-P., Taucher, J., Kolitsch, U. & Brandstätter, F. (2013): 1826) Caledonit, Linarit, Mimetesit, Munakatait, Plumbojarosit und vermutlich Oxyplumboroméit aus dem Kupfervorkommen der Wolfgruben bei Seiz, Liesing-Paltental, Steiermark. Pp. 138-139 in Niedermayr, G. et al. (2013): Neue Mineralfunde aus Österreich LXII. Carinthia II, 203./123., 91-146. Schachinger, T., Bernard, F. & Kolitsch, U. (2012): 1769) Mineralfunde vom Martinlager im Obertal bei Schladming, Steiermark. Pp. 167-168 in Niedermayr, G. et al. (2012): Neue Mineralfunde aus Österreich LXI. Carinthia II, 202./122., 123-180. Kunov, A. & Petrov, P. (2001): Beaverite from the Chala gold-base metal ore deposit: a new mineral for Bulgaria. Geokhimiya, Mineralogiya i Petrologiya 38, 67-71. Kampf, A.R., Steele, I.M., Jenkins, R.A. (2006) Phosphohedyphane, Ca2Pb3(PO4)3Cl, the phosphate analog of hedyphane: Description and crystal structure. American Mineralogist, 91(11-12), 1909-1917. G. Blass, H.-W. Graf and D. Sebold (2009): Neue Mineralien von der Grube Clara im Kinzigtal. Mineralien-Welt 20 (1), 87-89; Belendorff, K. & Sautner, P. (2009): Beaverit von der Grube Clara - eine Ergänzung. Mineralien-Welt 20 (5), 59.
ⓘ Genna zinc smelter slag locality ? Bortolozzi, G.M., Bracco, R., De Tuoni, F., Vidus, L., Bittarello, E., Marengo, A., Ciriotti, M.E., Zorzi, F. (2018) Antiche miniere e affioramenti metalliferi a Comeglians (Val Degano, Friuli-Venezia Giulia): recenti ritrovamenti. Micro, 16, 1-2018, 2-36; Giarduz, M., Marengo, A., Bittarello, E., Bracco, R., Rocchetti, I., Fassina, B., Ciriotti, M.E. (2018) Aggiornamento su nuovi minerali del comprensorio di San Giorgio di Comeglians (Udine). Micro, 16, 2-2018, 86-90. Ferretti, P., Fassina, B. and Rocchetti, I. (2018) Il giacimento manganesifero della miniera Erla (Baselga di Pinè, TN). I minerali e il sito estrattivo. Rivista Mineralogica Italiana, 42, 4 (4-2018), 246-261. Ohnishi, M., & Shimobayashi, N. (2011). 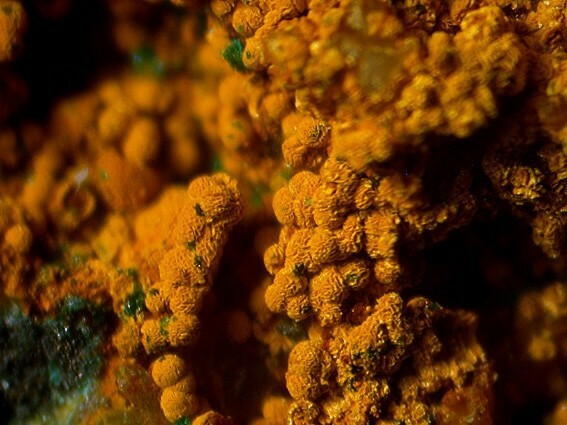 Tsumebite from the Kisamori mine, Akita Prefecture, Japan. Journal of Mineralogical and Petrological Sciences, 106(1), 51-56. Bill Shelton (2009) Mineral News, 25, #8, 15. Miguel Calvo Rebollar (2015). Minerales y Minas de España. Vol. VII. Fosfatos, Arseniatos y Vanadatos. Escuela Técnica Superior de Ingenieros de Minas de Madrid. Fundación Gómez Pardo. 479 págs. Kingsbury, A.W.G. and Hartley, J. (MS) (1951) New occurrences of rare minerals in the northern part of the English Lake District: part 1.; Kingsbury, A.W.G. and Hartley, J. (1957) Beaverite from the Lake District. Mineralogical Magazine, 31(239), 700-702.; Hartley, J. (1984) A list of minerals associated with the ore deposits of the Caldbeck Fells, Cumbria. Transactions of the Leeds Geological Association, 10(3), 22-39.; Cooper, M.P. and Stanley, C.J. (1990) Minerals of the English Lake District: Caldbeck Fells. Natural History Museum Publications, London, 160 pp. (referring to Kingsbury & Hartley, 1951-1957 and Hartley, 1984). ⓘ Dumpy Stone Level ? Kingsbury, A.W.G. and Hartley, J. (1956) New occurrences of vanadium minerals (mottramite, descloizite, and vanadinite) in the Caldbeck area of Cumberland. Mineralogical Magazine, 31(235), 289-295.; Kingsbury, A.W.G. and Hartley, J. (1957) Beaverite from the Lake District. Mineralogical Magazine, 31(239), 700-702.; Kingsbury, A.W.G. and Hartley, J. (1960) Carminite and beudantite from the northern part of the Lake District and from Cornwall. Mineralogical Magazine, 32(249), 423-432.; Hartley, J. (1984) A list of minerals associated with the ore deposits of the Caldbeck Fells, Cumbria. Transactions of the Leeds Geological Association, 10(3), 22-39.; Cooper, M.P. and Stanley, C.J. (1990) Minerals of the English Lake District: Caldbeck Fells. Natural History Museum Publications, London, 160 pp. (referring to Kingsbury & Hartley, 1956-1960 and Hartley, 1984). ⓘ Higher Roughton Gill (Balliway Rigg) ? Kingsbury, A.W.G. and Hartley, J. (1957) Beaverite from the Lake District. Mineralogical Magazine, 31(239), 700-702.; Kingsbury, A.W.G. and Hartley, J. (1958) Jarosite and natrojarosite from the Lake District. Mineralogical Magazine, 31(240), 813-815.; Kingsbury, A.W.G. and Hartley, J. (1960) Carminite and beudantite from the northern part of the Lake District and from Cornwall. Mineralogical Magazine, 32(249), 423-432.; Cooper, M.P. and Stanley, C.J. (1990) Minerals of the English Lake District: Caldbeck Fells. Natural History Museum Publications, London, 160 pp. (referring to Kingsbury & Hartley, 1957-1960). ; Green, D.I., Bridges, T.F., Rumsey, M.S., Leppington, C.M., and Tindle, A.G. (2008) A review of the mineralogy of the Roughton Gill Mines, Caldbeck Fells, Cumbria: Part 2 The Roughton Gill South Vein on Balliway Rigg. Journal of The Russell Society, 11, 3-28. Kingsbury, A.W.G. and Hartley, J. (MS) (1951) New occurrences of rare minerals in the northern part of the English Lake District: part 1.; Kingsbury, A.W.G. and Hartley, J. (1957) Beaverite from the Lake District. Mineralogical Magazine, 31(239), 700-702.; Hartley, J. (1984) A list of minerals associated with the ore deposits of the Caldbeck Fells, Cumbria. Transactions of the Leeds Geological Association, 10(3), 22-39.; Cooper, M.P. and Stanley, C.J. (1990) Minerals of the English Lake District: Caldbeck Fells. Natural History Museum Publications, London, 160 pp. (referring to Kingsbury & Hartley, 1951-1957 and Hartley, 1984). ; Bridges, T.F., Green, D., Rumsey, M.S., and Leppington, C.M. (2011) A review of the mineralisation of the Roughton Gill mines, Caldbeck Fells, Cumbria: Part 3 Roughton Gill Mine. Journal of the Russell Society, 14, 3-23. Kingsbury, A.W.G. and Hartley, J. (1956) New occurrences of vanadium minerals (mottramite, descloizite, and vanadinite) in the Caldbeck area of Cumberland. Mineralogical Magazine, 31(235), 289-295.; Kingsbury, A.W.G. and Hartley, J. (1957) Beaverite from the Lake District. Mineralogical Magazine, 31(239), 700-702.; Kingsbury, A.W.G. and Hartley, J. (1960) Carminite and beudantite from the northern part of the Lake District and from Cornwall. Mineralogical Magazine, 32(249), 423-432.; Young, B. (1987) Glossary of the minerals of the Lake District and adjoining areas. British Geological Survey, Newcastle upon Tyne, 104 pp. ; Cooper, M.P. and Stanley, C.J. (1990) Minerals of the English Lake District: Caldbeck Fells. Natural History Museum Publications, London, 160 pp. (referring to Kingsbury & Hartley, 1956-1957, Hartley, 1984, and Young, 1987). Anthony, J.W., et al (1995), Mineralogy of Arizona, 3rd.ed. : 134; Graeme, R. (1993), Bisbee revisited, Min.Rec. : 24: 421-436. Anthony, J.W., et al (1995), Mineralogy of Arizona, 3rd.ed. : 131; Butler, B.S., et al (1938b); Galbraith, F.W. & D.J. Brennan (1959), Minerals of AZ: 65. Anthony, J.W., et al (1995), Mineralogy of Arizona, 3rd.ed. : 125; Butler, B.S., et al (1938b), Geology and ore deposits of the Tombstone district, AZ, AZ Bur. Mines Bull. 143. Besse, William W. (1981) Mineral Paragenesis of the Grand Reef mine, Aravaipa mining district Graham County, Arizona. M.S. thesis, Department of Geology, California State University, Los Angeles. Anthony, J.W., et al (1995), Mineralogy of Arizona, 3rd.ed. : 131; Bideaux, R.A. (1980), Tiger, AZ, Min.Rec. : 11: 155-181. Hewett, Donnel Foster (1956) Geology and mineral resources of the Ivanpah quadrangle, California and Nevada, USGS Professional Paper 275, 172 pp. : 145; Pemberton, H. Earl (1983), Minerals of California; Van Nostrand Reinholt Press: 302. Collected by and in the collection of Al Wilkins. EDS confirmed by Bob Housley. Palache, C., Berman, H., & Frondel, C. (1951), The System of Mineralogy of James Dwight Dana and Edward Salisbury Dana, Yale University 1837-1892, Volume II: 568. Butler, B.S. and Schaller, W.T. (1911) Beaverite, a new mineral. Journal of the Washington Academy of Sciences: 1: 26-27.; Butler, B.S. (1913) Geology and ore deposits of the San Francisco and adjacent districts, Utah. USGS Professional Paper 80.; Palache, C., Berman, H., and Frondel, C. (1951) The System of Mineralogy of James Dwight Dana and Edward Salisbury Dana, Yale University 1837-1892, Volume II: 568.; Kingsbury, A.W.G. and Hartley, J. (1957) Beaverite from the Lake District. Mineralogical Magazine, vol. 31, n° 239, 700-702 (referring to Butler and Schaller, 1911).